Mutations in the human genome may be responsible for many diseases. 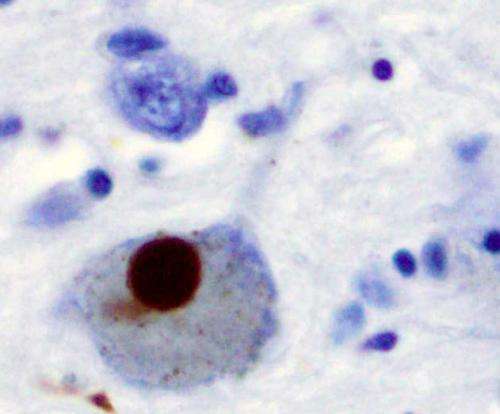 In the case of Parkinson's disease (PD), five locations have been the subject of recent attention. Variants of one of these locations, ACMSD (aminocarboxymuconate semialdehyde decarboxylase), may be implicated in PD, but until now, no mutations in ACMSD have been found in any PD patients. In a study in the Journal of Parkinson's Disease, researchers found a unique mutation in a 74-year-old man with PD. This mutation is not found in the neurologically normal population, and may be the first indication that rare variants in ACMSD alone might increase the risk of PD. The novel ACMSD mutation was identified during a genetic screening study of 62 PD patients on the Mediterranean island of Menorca, which were matched with 192 ethnicity-matched neurologically normal individuals with no family history of PD. The study was initiated by investigators Eduardo Tolosa and Dolores Vilas, who are enormously grateful to Dr. Casquero and the "Associació de Malalts of Parkinson of Menorca" for her work on diagnoses and patients' recruitment. Genetic variants found in these individuals were checked against various databases to identify normal variations observed in other populations. While researchers found mutations already associated with PD, they discovered one novel mutation in the ACMSD gene in a single patient with no family history of PD and none of the known PD-related mutations found in other populations. "Our findings suggest that a new mutation in the ACMSD gene could be a risk factor for PD. It could lead to the identification of more cases with genetic PD, both sporadic and familial, and consequently to better management of the patient. The ACMSD gene was previously associated with the risk for PD by various genome-wide association studies," explained lead investigator Coro Paisán-Ruiz, PhD, Department of Neurology, and Departments of Psychiatry and Genetics and Genomic Sciences, Icahn School of Medicine at Mount Sinai, New York, NY. The ACMSD gene encodes for an enzyme in the kynurenine pathway, aminocarboxymuconate semialdehyde decarboxylase, involved in the metabolism of tryptophan. Some metabolites of the kynurenine pathway are known to play an important role in the central nervous system in both health and disease states. Specifically, ACMSD activity results in less accumulation of quinolinic acid which is a molecule known to have neurotoxic properties. Not only does quinolinic acid cause "excitotoxicity" (overstimulation of nerve cells leading to their death), but it can also directly activate the immune cells of the brain, i.e. microglia, and thereby trigger inflammation (already known to occur in PD). Therefore, there is a good pathobiological rationale for why reduced levels (due to the mutation) of functional ACMSD can result in the type of neurodegeneration seen in PD brains. "The results of the current study are of great interest because the identification of a new mutation linked to the disease could lead us to a better understanding of the disease and, eventually, to the development of new therapeutic strategies," explained Dr. Paisán-Ruiz.